Today I have a fun travel post (and video!) 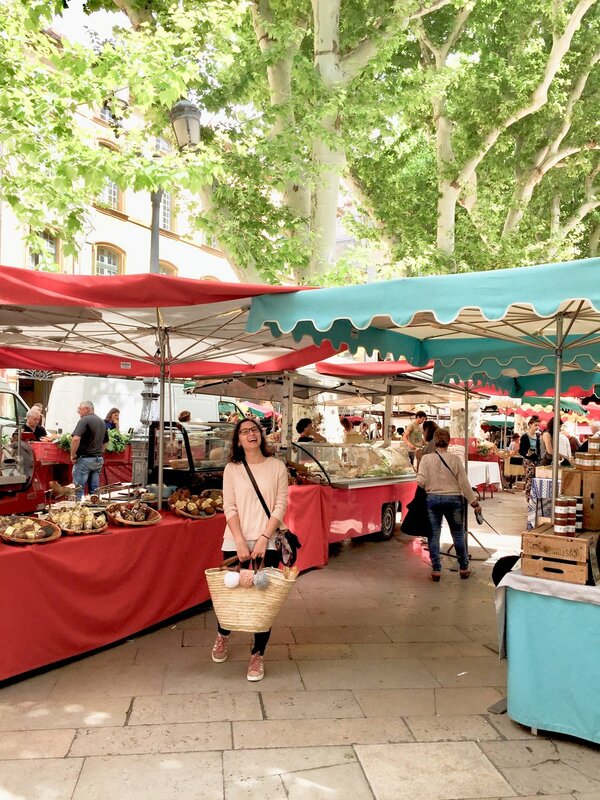 sharing some of my favourite things to do in the beautiful city of Aix-en-Provence. Located in the South of France, it was definitely one of my favourite places that we visited while on our honeymoon! While I do of course love big cities like Paris, I always seem to fall head over heels for the smaller towns that just seem to have that extra special magic about them, and the area we stayed (right in the middle of the Old Town) was oozing with charm and delights around every corner! Beautiful old buildings, moss-covered fountains (it’s known as “The City of a Thousand Fountains” for a reason! 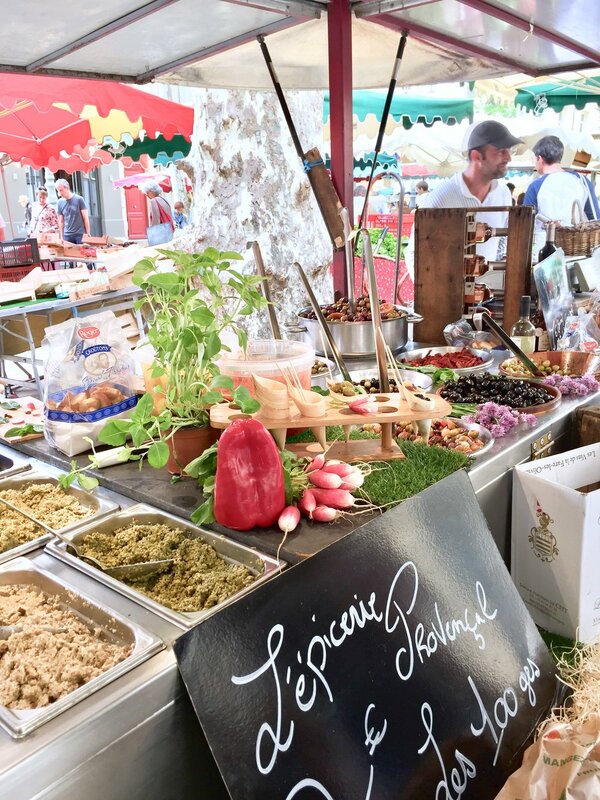 ), and vibrant markets held in the town squares under the shade of giant plane trees... a perfect French town to explore! While there’s lots of history to discover, for us, the thing we most enjoyed was simply having a relaxed day, exploring the markets, stopping for a cup of coffee, and just taking in the atmosphere of this gorgeous town. Often when travelling, it can be tempting to run around trying to see all the sites and tick them off your list, and while that works for some people, (if that’s your thing – go for it!) we much prefer the “slow travel” approach. Strolling around with just a rough idea of things you want to look out for and lots of space in the schedule so you can just take your time and see what cool things you stumble upon, is my favourite way to experience a new place (especially a smaller town like this one!) so that’s what I’ll be sharing today! 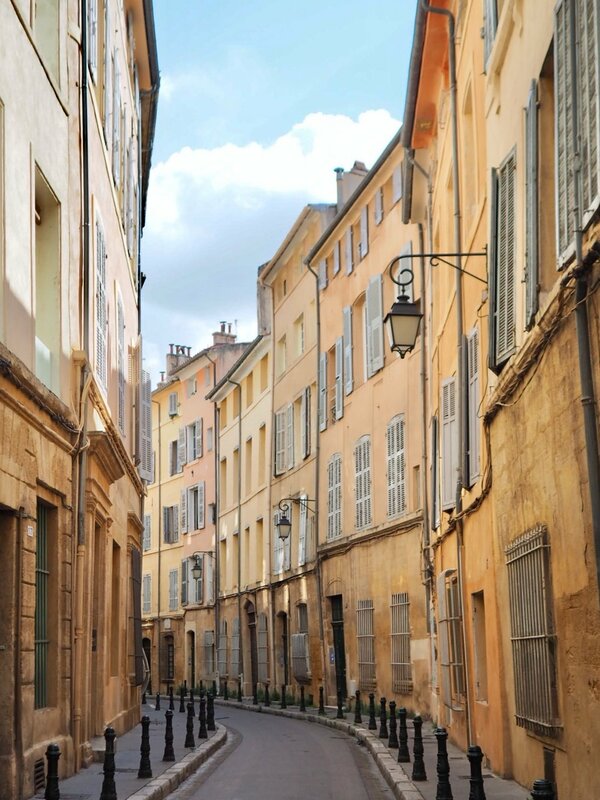 This post is not about ticking things off a list or covering everything there is to see and do in Aix, but it will hopefully give you a taste of this beautiful town and inspire you to add it to your wanderlust list! We arrived around 8 am as some of the stalls were still being set up and it was nice to be there early and enjoy a calm stroll around, appreciating the beauty of all the incredible blooms before it got too busy! We visited in May so there were peonies galore, and I have never seen so many peonies in my life! All different colours - white, pastel pink, coral, vibrant fuchsia, burgundy… They were so gorgeous with their beautiful fluffy petals! If you’re staying for a few days, I highly recommend picking up a bunch of flowers! I wasn’t planning to (it seemed a bit extravagant to buy flowers while on holiday!) but we were there for 4 days and Tom knew how happy they would make me, so he insisted I purchase some! 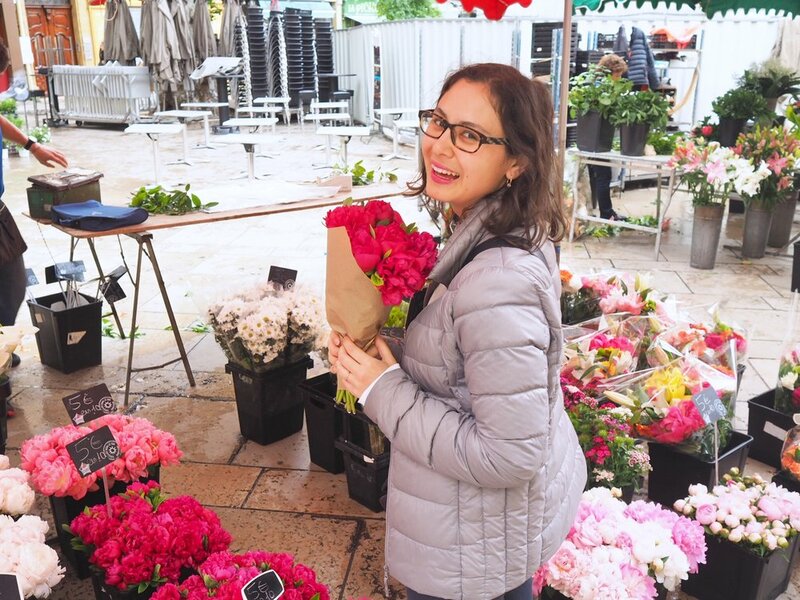 They were actually so cheap – only 5 Euro for 10 peonies, and for the amount of joy they brought me all morning as we were strolling around the town, and then brightening up our AirBnb, totally worth it! 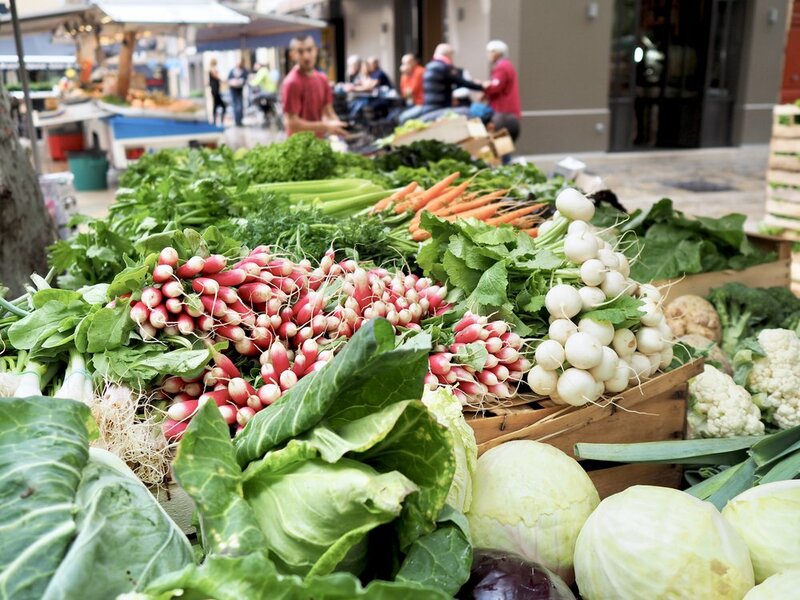 Under the shade of some beautiful big plane trees, you’ll find a huge array of fruits, vegetables, meats, cheeses, marinated olives, sun-dried tomatoes, dried fruits, jams, and other delicious things! We bought some dried strawberries, melon and pineapple to nibble on as we walked around (I recommend the pineapple the most – that was my fave!) and sampled the olives and dips that the vendors were kind enough to offer us! Even if you're not planning on cooking during your stay (we didn't! ), it's still nice to pick up some bits and pieces like tomatoes, olives and an assortment of dips and fruit to snack on! I recommend coming back to this market for lunch later on, as there was a stall offering delicious baguettes with melted cheese and your choice of filling (we chose prosciutto). Our AirBnb was actually just around the corner from this market, so we visited everyday! We even bought one of the cute wicker baskets that all the locals have to carry our things in! 3) After the markets, head to Patisserie Weibel in the south-east corner of the square – a beautifully decorated café serving the most delightful treats!! We headed inside as it was a little rainy the morning when we visited and chose the window seat so we could look out onto the square and people watch as everyone went about their business at the market while we ate our breakfast. Tom ordered the “Weibel Breakfast” which came with a hot drink, orange juice, a croissant and toast, and I had a cappuccino and delicious vanilla macaron. I have such good memories of this moment in this café - watching the world go by, enjoying our coffees, appreciating the beautiful peonies and just being so excited to be on holiday in France!! We actually visited Weibel three times in the four days we were there because we had to sample the other delicious pastries! It was also such a nice place to just sit down and have a rest after walking around all day! I loved the decor - beautiful blue-grey walls, gorgeous gold mirrors and a lovely view out the window! The staff were also very friendly and patient as we practiced ordering in rather clumsy French! 4) Once you’ve eaten, take some time to just stroll through the streets and explore! 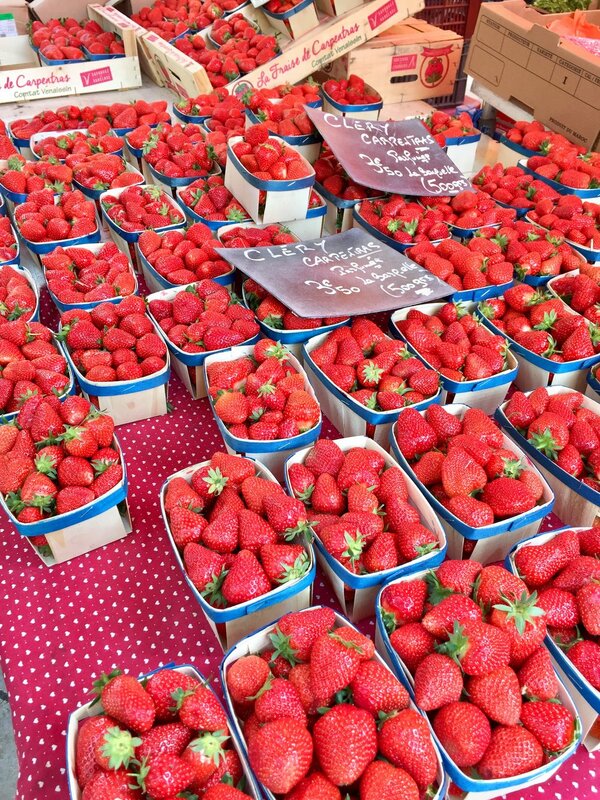 5) Head over to Cours Mirabeau – one of the most famous streets in Aix-en-Provence where you'll find another market! It was lovely to walk along enjoying the sun and the accordion music which created such a vibrant, fun atmosphere! From what I've researched, there is also usually an antique market at Place Verdun on Tuesday, Thursday and Saturday, however this square was under construction while we were there! 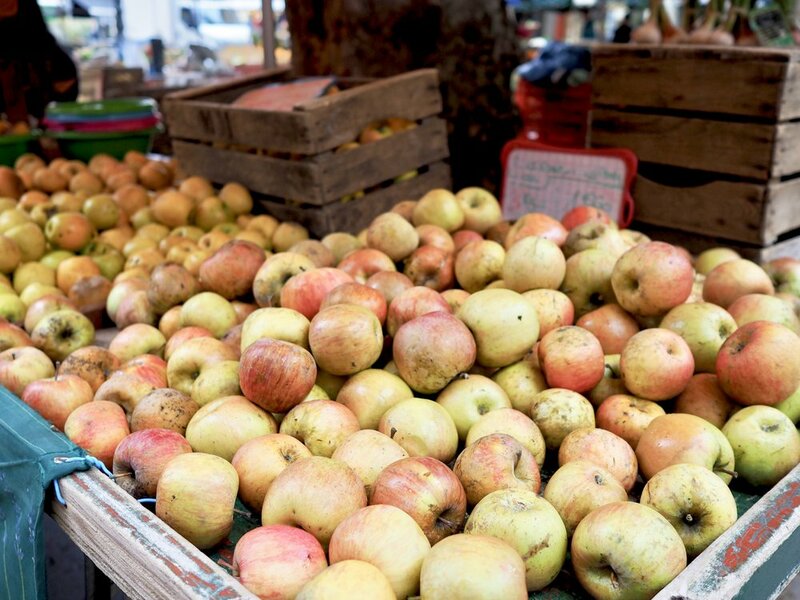 6) Find a café and enjoy a drink or lunch, or head back to the food market and pick up something yummy to eat! This is where my suggestions veer away slightly from what we actually did that day! 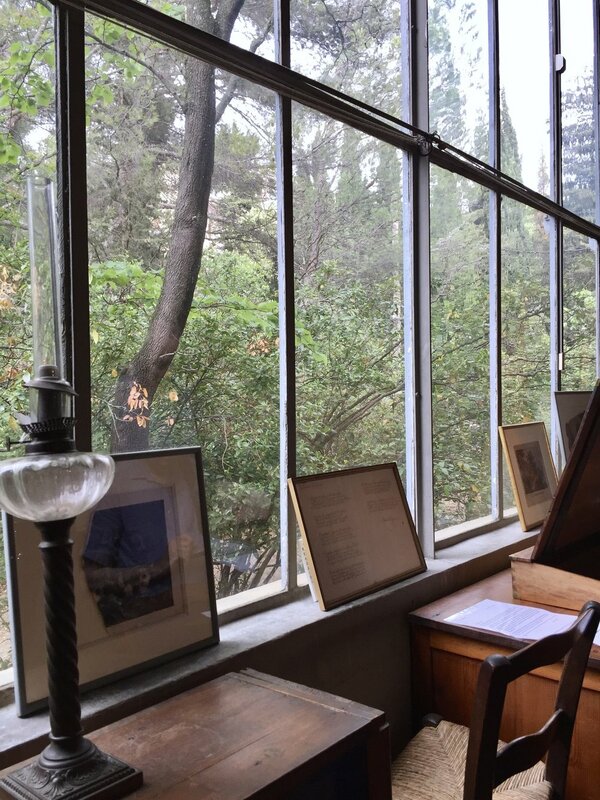 You'll hear a lot about the famous artist Paul Cezanne while in Aix and his studio is definitely worth visiting. The room holds many of Cezanne's possessions that appear in his artworks and this is where he worked for the last years of his life, painting in this studio every day. It's a beautiful space with high ceilings, wooden floorboards and big windows looking out onto the leafy garden. The gorgeous blue-grey paint on the walls was chosen specifically so the neutral colour wouldn't interfere with the light and affect his painting. There was also a large slot in the wall, designed so his large canvases could be brought in! The studio closes around lunch time and opens again at 2pm. I'd recommend going at this time as we were able to be the first ones in after lunch and it gave us the chance to have a quick look at the room before it became crowded with people! Entry was about 6 Euro each and we also purchased the audio guide for 3 Euro which provided some interesting background on Cezanne's life and work. So that brings me to the end of this rather long post! I hope you've enjoyed seeing the photos and that it's given you a little travel inspiration! 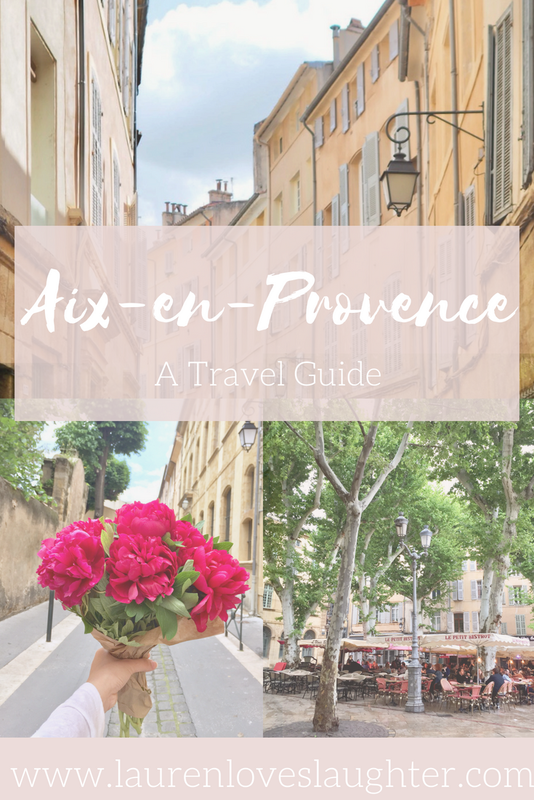 Let me know if you're planning on adding Aix-en-Provence to your travel list and tell me what's the most charming town you've ever visited? I love finding beautiful places to add to my wanderlust list! !